Caparison's take on contemporary rock guitars is a blast of fresh air – but will we be blown away? An infinitely playable hand- crafted rock guitar that should definitely be on shredders' radar. The dual-neck pickup concept is unusual, but it seems best suited to studio use. Since it acquired the brand in 2011, the UK-based Caparison Guitar Company has been responsible for focusing the aim in a distinctly mainstream direction. Although still preferring a low- volume but high-quality output, these rock and metal guitars are beginning to emerge as serious contenders to the higher-end models of rock aristocrats such as Ibanez, ESP and Jackson. To correlate with this growth, 2015 sees the expansion of each of its model ranges, including new additions and upgrades to existing models, a couple of eight-string guitars and a new signature. Here, we're reviewing the new Dellinger Prominence. "The ebony fingerboard is super-smooth and along with jumbo frets provides a platform popularised by rock guitar brands such as Jackson in the late 80s and which many rock players gravitated to." In Caparison's world, the Dellinger model is a mainstay model with this new Prominence version being the first carved top version. In reality, the spec is very similar to the MJ3 with the most notable differences being that carved top and a strikingly unusual pickup configuration. Also present here is Caparison's 'M3 composite tonewood' body, comprising two different tonewoods, mahogany and maple. Under the new-for- 2015 transparent finishes, including our review model's Spectrum Red, you can see how these woods have been combined: a central section of maple flanked on each side by mahogany. We have a Dellinger neck profile that is stunningly comfortable and with the slick oil finishon its back enables effortless movement without any inherent 'stickiness' associated with some high-gloss finishes. As its appearance suggests, this is an unabashed balls-to-the-wall rock guitar and the extended cutaway, upper-fret-friendly neck join and jumbo frets are taunting you to unleash the flashiest, most finger- twisting licks in your arsenal. The body shape will, of course, be familiar to most guitarists, but the forearm contour is very subtle here. While it's not in slightest bit uncomfortable, some players may miss the extra comfort that a more pronounced contour can provide. "If rock and metal is your bag then Caparison should rightly be considered specialists." At first glance it's difficult not tobe captivated by the unusual pickup configuration, which features not one, but two Caparison-designed neck pickups, both vying for control of the warm-end of the sonic spectrum. But is it a gimmick? Well, if you're predominantly playing rock music then it can sometimes prove difficult to cut-through the mix when using single coils - especially in the neck position,and especially when switching between that and a humbucking bridge pickup. So, having both a single coil and a single-coil sized humbucker in the neck position could prove a welcome feature for a rock player, looking for maximum versatility. The neck humbucker, though capable, is just a tad underpowered for producing the thick, creamy rock tone that would fully justify its position alongside a single-coil pickup, and yet on a clean setting the single-coil neck pickup doesn't quite produce those warm, springy chords it promises either. However, the single coil is infinitely usable in a studio environment, and we'd wager that this was the thought behind its inclusion. Despite the myriad configurationson offer from the five-way lever switch,we find it difficult to wander too faraway from that bridge pickup. When it's accompanied by a dirty amp setting, the pickup immediately provides a rousing full-bodied rock tone with enough output and character for crunchy rhythm work and sufficient high-end to make solo work stand out. It's hard to fault. "The Caparison humbuckers more than stand up to their big-name rivals, giving an instantly gratifying rock tone..."
A rotund C shape best describes the Angelus's neck carve and it's similar in feel to a 'regular' PRS profile. It's a generically comfortable shape that along with the ebony fingerboard and jumbo frets provides a super-smooth ride. A 24-fret neck with a 'short' 629mm Gibson scale can justifiably fill the fuller-fingered guitarist with trepidation, but although this particular reviewer does not possess particularly large hands, the fear of cramped fret space never really revealed itself, perhaps due to the large fretwire that provides a healthy distinction between notes. If rock and metal is your bag then Caparison should rightly be considered specialists. 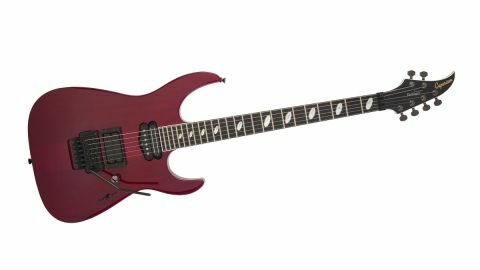 There are many variants of rock and metal guitars throughout the Caparison range, and kudos has to be given to the company or sticking with what it knows best, given the temptation of most brands to cater to guitarists of every conceivable style. Again, the Caparison humbuckers more than stand up to their big-name rivals, giving an instantly gratifying rock tone without the sometimes over-saturating gain of a high-output pickup that can all too often mask the tonal character of a guitar.